The story of the Burger Boat Company began in 1863 when Henry Burger founded a small boat yard in Manitowoc on the shores of Lake Michigan to build 20 to 30 foot fishing boats. His expertise and penchant for building very high quality vessels quickly became known on the Great Lakes and the yard expanded rapidly, launching its largest yacht, the 52 metre steamer Petosky, in 1888. In 1902 Henry Burger sold his yard to the Manitowoc Dry Dock facility. However the name continued as his nephew, also called Henry, had 10 years earlier established a yard across the river called the Henry B Burger Shipyard. It is from this site and directly from this company that the current Burger Boat Company has evolved. In 1901 the yards first motor yacht, the 26.4m Vernon Jr was delivered and within 10 years the company had established a reputation for building fine motor yachts up to 30 metres. With the advent of electric arc welding, Burger built the USAs first steel-hulled yacht, the 24m Tamarin in 1938. 1952 brought another innovation as the yard built the first welded aluminium vessel, the 11m Virginia. In 1959 the company was reorganised to become the Burger Boat Company and the first decision by the new board of directors was to end sailboat construction. Building in steel ended in the early 1960s as Burger increasingly focused on building aluminium motor yachts. The economic downturn in the 1980s saw the company sold to John McMillan in 1986 and then sold again to Tacoma Boat in 1989. Burger closed its doors in 1990 when Tacoma Boat folded but was rescued in 1993 when Chicago entrepreneurs David Ross and Jim Ruffolo bought the company. Together, they re-formed a highly skilled workforce and brought cutting-edge techniques to building yachts of the highest quality. It is a tradition that continues to this day and here we present six of the finest Burger motor yachts currently for sale. The 32.6m Silver Seas is a thoughtful creation based on the needs and desires of an experienced yachtsman. She provides all that is necessary for a party of eight to cruise inland and on coastal waters or venture to offshore islands in great comfort, safety and style. Her hull form and range of 3,000 nautical miles makes her eminently capable of transoceanic passages. Featured along with all necessary offshore safety equipment are up-to-date systems, good speed, moderate draught and a traditional profile with a comfortable, elegant interior. Her broker, John Todd at Burger Yacht Sales, comments, Silver Seas is one of our favourite designs from the board of Donald OKeeffe. She is a serious sea boat with full moulded chines and constant deadrise all the way to the transom. The net effect is the ability to carry 10,000 gallons of fuel and cruise considerable distances at displacement speeds. The current owner has just acquired her from his fathers estate and is in refit mode at present with a paint contract due to commence in just a few weeks. He has just gone through the interior with new soft goods, electronics, entertainment systems, machinery updates, etc. Grand Cru is a classic 32.3m raised pilothouse Burger motoryacht with numerous and recent upgrades, including major refits in 1995, 1998, 2000 and 2010. Her upgrades include new generators in 2005 and foredeck teak removed, new low maintenance decks installed and superstructure repainted in 2011. 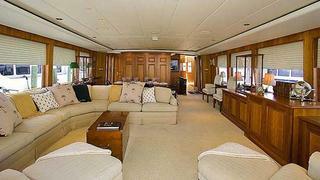 Grand Cru offers three cabins, all with en suites, and a main deck dayhead. 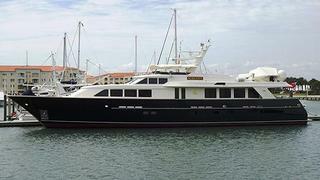 She also offers an air-conditioned, enclosed aft deck, huge cockpit and flybridge. Aluminium-built Serenity accommodates eight guests in four cabins and has twin 1,400hp Caterpillar engines, which power her to a cruising speed of 16 knots. The 26.5m Blue Star was built in 1987 to a design by Jack Hargrave. This yacht has been maintained in exceptional condition and comes with a generous saloon, raised pilothouse helm station with bridge stairs, private dining room for eight and a modern galley. 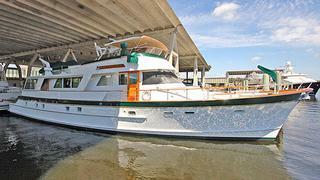 She accommodates six guests in three cabins. Motivation is an as-new, freshwater Burger with low hours on her Caterpillar engines. She has three en suite cabins plus an en suite crew cabin forward. 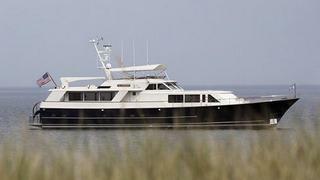 Features include an open aft deck, walk-around side decks, a large saloon, dayhead, raised pilothouse and a country kitchen forward of the pilothouse. Comments John Todd at Burger Yacht sales: Motivation is a real sleeper. Her original owner of 16 years uses her sparingly as he does not always launch her for the season if he has other travel plans in store. The boat has never seen salt water and has about a thousand original hours on her Cat 3412s (updated recently with new software for increased horsepower and functionality). 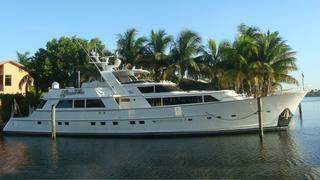 Built in 1974 to a design by Sparkman & Stephens, the 24.38m Silver Cloud was refitted in 1996. Accommodation is for six guests in a master suite and two twin cabins while twin 460hp Caterpillar engines give her a maximum speed of 14 knots. 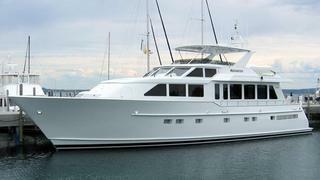 Whit Kirtland at Bradford Marine Yacht Sales says of her, This classic Burger was originally built as a 72 motor yacht. In 1996 a cockpit was added to her at Rybovich Spencer and her LOA was increased to 80. At the same time the teak on her main deck was renewed. In addition to having lovely traditional walnut stained teak panelling in her main saloon, Silver Cloud has a working fireplace.